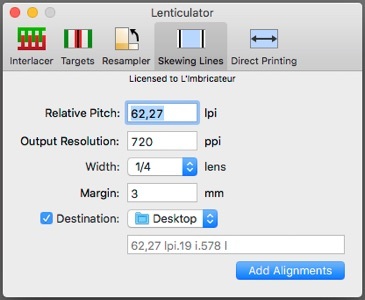 We have made for our own work an interlacer which enables to build the lenticular interlaced MasterFile, where each lens is represented by a flat number of pixels. 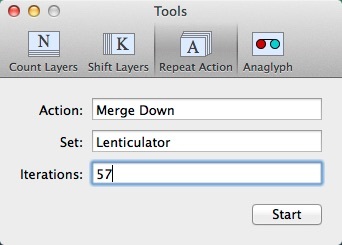 to end up with the OutputFile, ready for printing. 1°/ The first part will produce the high resolution MasterFile digitally interlaced in which each part of the picture representing one lens is composed of a flat number of pixels. 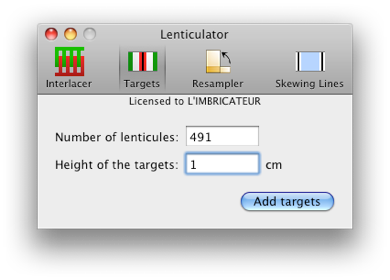 This Masterfile will be valid for the determined number of lenses of ANY lenticular sheet . The interlacing does not take care of the particular lenticular sheet that will be used, but only of the account of lenses that will be used on that sheet. The resulting MasterFile is to be saved. 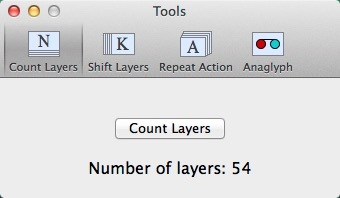 The interlacing is resolution-independant, any number of layers, and the files can be Grayscale, RGB, or CMYK. 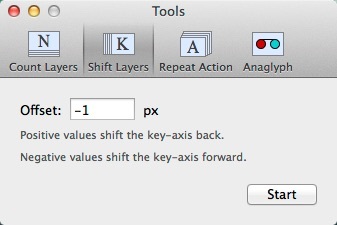 enables to add optical targets to the Masterfile. of the centering of the phase. 3°/ Third part resamples the MasterFIle to the OutputFile. 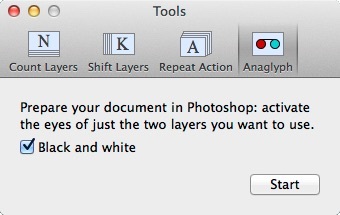 A previously saved MasterFile can at any time be resampled according to a new pitch.This is very convenient if you have to start a print over again simply because you need to slightly adjust the pitch : the interlaced Master remains valid, all you need is to proceed to a new Output resizing after entering the new pitch. on to the print and avoid cross-stepping. The width of the Skewing Lines is adjustable from 1/6th of a lens to one half of a lens. 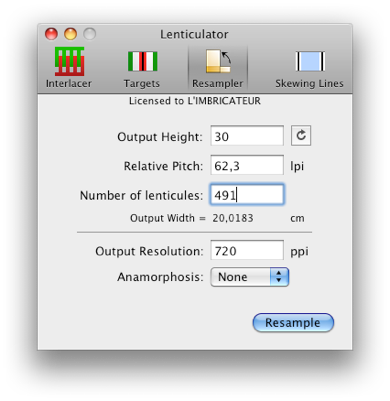 Lenticulator works RGB, CMYK, and Greyscale, with no size limit and no number of layers limit. 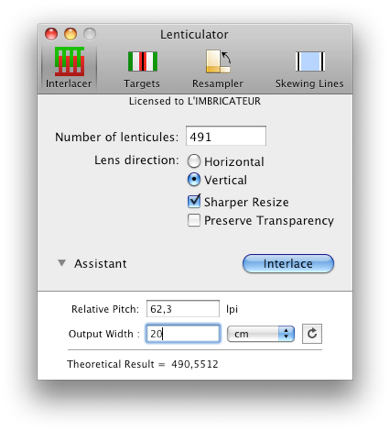 Lenticular is a complicated field for beginners. Save months of research and experimenting : ask for our Training sessions ... Please Ask.